Lyndsey Mask is the Educational Coordinator with Shaw Woods Outdoor Education Centre, a not-for-profit organization based in Renfrew County, Ontario, Canada. Lyndsey attended Nipissing University and graduated as a teacher in the spring of 2008. She fell in love with outdoor education when working as a Natural Heritage Education (NHE) Interpreter at Balsam Lake Provincial Park in the summer of 2008. 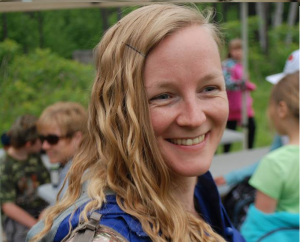 She went on to become an NHE Leader at Grundy Lake Provincial Park in 2009 and since then has dedicated herself to bringing the classroom and the natural environment together. From the fall of 2012 to the spring of 2013, the Shaw Woods Outdoor Education Centre had almost 1, 300 students visit from around Renfrew County. Lyndsey will work with dedicated volunteers to help spread the message that children and nature go hand in hand. “Think Outside” indicates a sense of freedom of thought and imagination. The ability to question without cause or justification, like the innocence of a child. To harness an independence that fosters growth and appreciation for a person’s own ability to reach limitless potential. Experiencing this freedom is much simpler to obtain when connected to nature. My favourite thing to do outside is watch my two little girls play; whether it be with rocks, sticks, or mud; to see them get full of soil and run bare foot through the grass; to enjoy the precious moments when they learn to swim underwater, ride their bicycles, and jump on the trampoline; to water and talk to the flowers; to pick beans fresh from the garden; to experience life, through their eyes and their imaginations. I am a very proud Mom of two incredibly adorable girls. My oldest, turning four November 2013, is named Paytience; my youngest, turning two September 2013, is named Hope. I would like if people would reconsider the fast paced society that surrounds us, and to reconnect with a much simpler time. A time when wastefulness didn’t make sense, when everything had a purpose, when the natural world was in abundance. To get people to realize that the best medicine is truly amongst the trees and in order to heal this planet and its people, we need to start paying attention.